Archives and museums have long served as sites that hold wisdom and the promise to awaken curiosity, imagination and memory. However, more than in buildings where treasures are placed in vaults and beneath glass, this promise also sits in both the tangible and intangible. Its richness is manifest in the natural and social landscape; retained in the names of mountains and trails; radiating from cityscapes onto dirt roads that touch agricultural lands, plazas, burial grounds, and deeper still, layered into the archaeology of ruins. Profoundly, it is also found in prayers, songs, language and perceived even in the dust rising from dances that have persisted for ages. Finally, it is carried in the stories that are passed down from one teller to the next. Understanding this broader context of “where” wisdom and its attendant promise sit can illuminate knowledge, inspire creativity and above all, fortify the communities in which cultural-based institutions are located. It is precisely this redefined vision that frames my reflections in this essay, recognizing not only the potential for archives and museums within their broader social landscapes, but also for reimagining what they might look like, sound like, feel like when re-created by communities. By identifying and leveraging their rich cultural and creative legacy, we hold the potential to create and sustain healthy, vibrant and resilient cities, villages and neighborhoods. What resulted is still evolving, though the work fundamentally revealed the possibility. To that end, I offer some thoughts to set context, identify challenges, and also point to the opportunities for expanding this project. The redefined vision and objective noted above necessarily points to the promise before us. Overlooking the fact that there is also a troubling underlying duality, however, would be a great mistake. While official repositories have existed and long since incorporated even the most marginalized communities, decisions about what was valued and collected, about how it was classified and for whom it was made available are essential questions still today. Considering archives, the French philosopher, Michel Foucault, would define the colonial archive as a “monument to particular configurations of power,” and point to much of what is contained therein as “documents of exclusion,” which privileged some voices and silenced others.¹ Political theorist, Benedict Anderson also speaks to a more critical analysis of these sites in his book, Imagined Communities — a powerful work on nationalism, but also one that helps us think about how the residents of a place come to recognize their communion. In it, he prefaces that maps, censuses and museums, all once defined as institutions of power, also “profoundly shaped the way in which the colonial state imagined its dominion — the nature of the human beings it ruled, the geography of its domain and the legitimacy of its ancestry.”² It is important to recognize this historical context because it encourages a focus beyond simply that of stewardship, to different core values and strategies, such as equity and engagement. Academic enterprises were equally harmful in terms of the erasure or misrepresentations of people and places. This is especially true for communities largely impacted by colonialism and imperialism, where stories have been marginalized, obscured and systematically erased over time. For people whose experience is marked by displacement and loss, including of knowledge, land, objects and historical records, recovery remains an especially critical imperative. In the end, extractive practices pulled information and artifacts out, though there was no reciprocity, nor benefit for those who once held these items. What was left behind were fragments, both physically and emotionally. Recognizing this context, social activist and author, Bell Hooks, once astutely noted, “Remembering makes us subjects in history,” but in the same essay wrote about both the challenge and imperative of memory.³ In this way, remembering, from the Spanish word, recordar, implies, to awaken; but it is also as the Latin word, recordis reveals, to pass back through the heart and make whole again. This is not an easy process, however and when the project of remembering is expanded to a larger collective and collaborative effort, the issue becomes more difficult than simply collecting and storing. Toward this end, there are several salient questions that emerge, particularly in an era when defining the past has become so polarizing, even within individual communities and families: What is a community? ;What constitutes a collective endeavor? ; What defines collaboration? ; Who decides what to collect, when to collect and to what end? These interrogatories are not easily answered, particularly since there are multiple approaches to ‘doing history;’ and even in a singular circle of people, there can be numerous viewpoints and consensus not always easy to reach. Set within these challenges of developing a community-centered memory project, there are notable moments in the history of the United States when efforts were made by the U.S. government to document the experiences of its residents. In the face of the nation’s economic depression during the 1930s, President Franklin Delano Roosevelt established his New Deal Works Progress Administration (WPA) to implement work relief programs and initiate a monumental government intervention, which integrated sweeping cultural infrastructural projects across the nation. 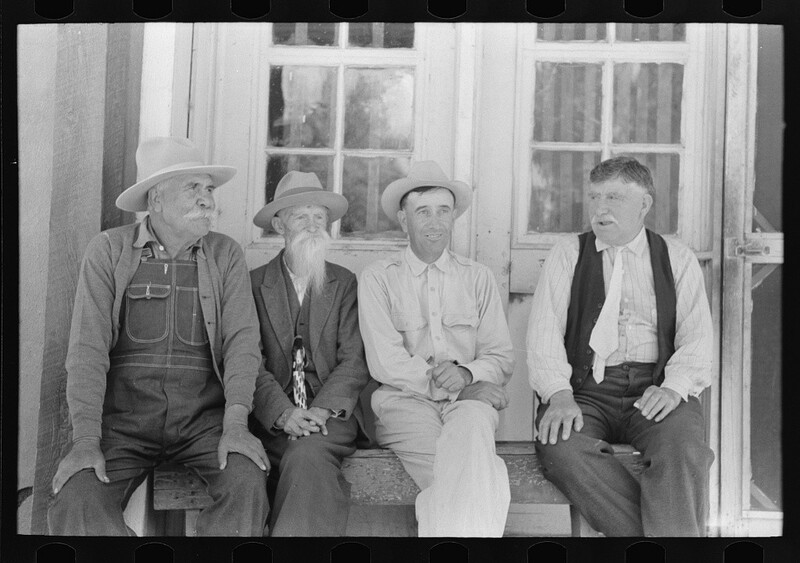 One of several federal WPA programs, the United States Farm Security Administration and Office of War Information (FSA-OWI) hired photographers to create an extensive pictorial record of American life between 1935 and 1944 across the United States. The images are an incredible legacy capturing the natural, built and social environment of many places, images of people, buildings and landscapes that no longer exist, and which may never have been documented at all if not for this project. Like earlier documentarians, however, this work was set within a very political circumstance as a public relations campaign — to provide visual justification to the American public for the need of a government program to combat poverty during a time of drastic economic hardships and dislocations in rural communities. Additionally, it is important to recognize that these images were subject to decisions about who, when, where and how they would be taken, notwithstanding the positionality and subjectivity of the photographers themselves, none of whom were native to the region. There was another layer of the politics of representation. For instance, in New Mexico, the names of residents captured in the project are not part of the record, though White subjects (e.g. nurses, doctors, priests) are identified by name. In one village, while the name of a German merchant is listed in the photo taken of him in his store, the names of Hispanic merchants photographed just up the road are not. The fact that there is such nominal detail provided with these photos reveals how little this information was actually valued. While some of these images have been published by scholars, and all are available through the website of the Library of Congress, the vast portion remain obscured from the communities to which they are connected. Notwithstanding these issues, these images remain a part of the patrimony not only of the nation, but of the individual communities originally captured on film. There is an opportunity, in part, for institutions to proactively engage with communities, perhaps using intermediary platforms like ‘Historypin’ that have some integration with social media platforms, but that also have the ability to archive content, comments and questions; refine metadata; and download data.⁴ While it represents certain technical challenges, aggregating organizations like Europeana, the US National Archives, and Digital Public Library of America in partnership with Historypin, Amara and other third party organizations have shown that it is possible. Through this type of collaboration with knowledge communities, descendants can add missing information, such as biographical and geospatial data, thus re-scripting and contextualizing the narrative. This effort also can result in people seeing themselves reflected in history when previously and traumatically erased, leading to an enhanced sense of identity and healing. In 2004, the social media networking service Facebook was launched and, now nearly 15 years later, there are over 2.07 billion active monthly users. In 2010, the company launched a feature to create a space for “groups” to connect people separated across time and space. The introduction coincided with the exponential interest in genealogy, which expanded largely by a focus on television and also to millions of records uploaded online, which facilitated research and interconnectivity of the past and present, but also between family members. 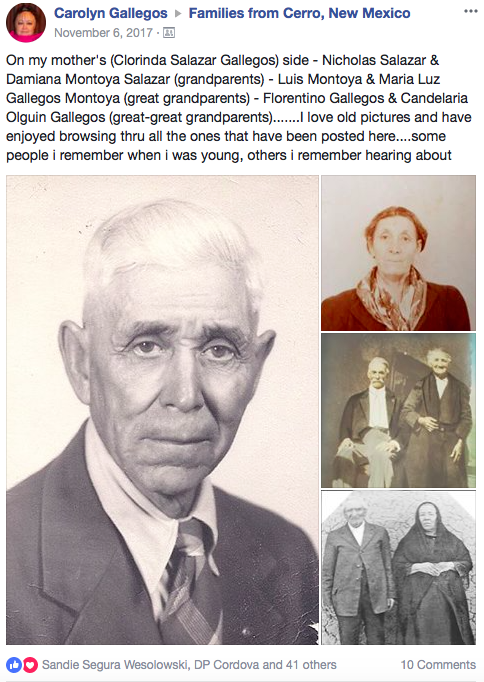 First post by Carolyn Gallegos on the Cerro, New México Facebook Group, in which she shares images of her ancestors. 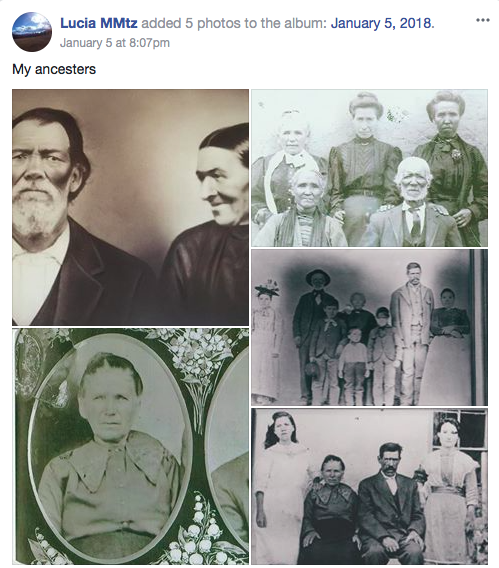 Second posts by Lucia Martinez on the Questa, New Mexico Facebook Group, in which she shares images of her ancestors. 2017. I first learned about these groups when I was invited to join one in 2015. Although I had sporadically used Facebook for years, I never once posted anything to a group. This all changed last fall when three of these groups formed in the towns in which I was raised. The initial impetus came from only four individuals who had connected via a genealogy Facebook group and was initially conceived to connect particular families to share information and augment existing family trees. By mid October, what had begun with less than 45 members in the first week, has grown collectively to nearly 3,500 individuals. The tremendous groundswell in this project has encouraged people who have never used social media to sign up, and also activated an involvement and momentum in documenting the histories of these places like no other I have witnessed previously. While it has not yet been determined all of the reasons drawing people to the site, anecdotally, it primarily seems because people want to learn more about their ancestry, to identify or rekindle family connections, or to illuminate or recover traditions and history of the villages. 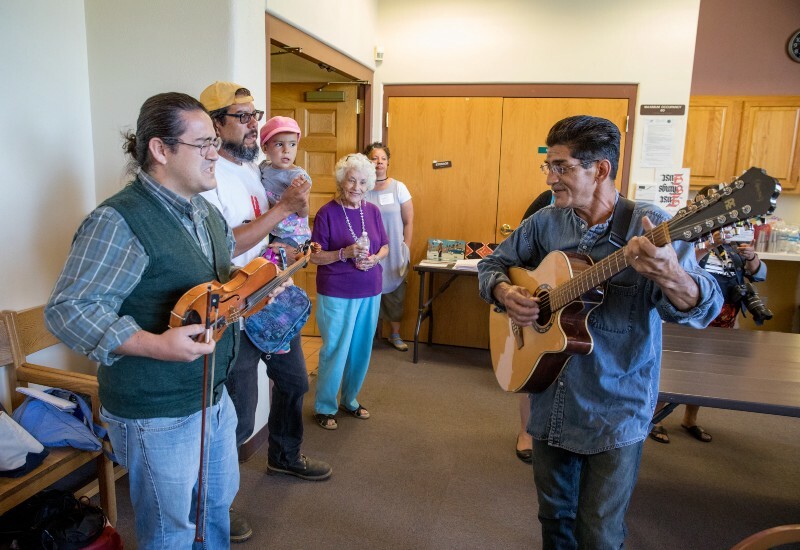 The groups that started in October 2017 were focused on the rural towns of Amalia, Cerro, Costilla and Questa, settlements that form the northern boundaries of Taos County in north central New Mexico. The area is predominantly comprised of residents that are identified as Hispanic, with a heritage that can be traced to both indigenous people whose long presence extends back thousands of years, as well as to Spanish-speaking people whose ancestors, born from a mixture of indigenous, European and African people, had been present in this region since 1598. While demographic data is not readily available for each of the villages, information for the incorporated town of Questa — a place roughly five square miles in area and with a population of 1,748 people from 733 households — is representative: median age, 47; females, 57%; males, 43%; median household income, $26,761; and 29.5% of people living below the poverty line.⁵ On the surface, this data reveals the state of rural villages today. However, a deeper analysis could distill even more profound insight, such as how villages are tied to cities, pointing not only to the history of migration patterns out, but also that the village continues to function as “homeland,” evidenced through the extraordinary draw to these Facebook groups. 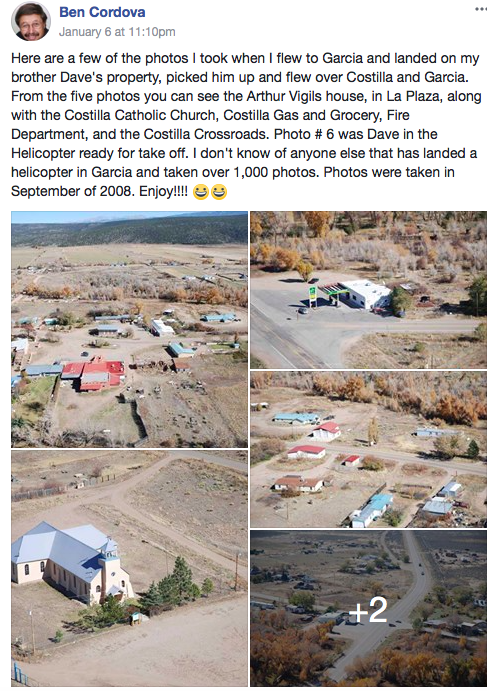 Post by Ben Cordova about aerial photographs taken of the village of Costilla, New Mexico, Costilla Facebook Group, 2017. Although this demographic data is important to understanding the rural villages that serve as the focal point for these groups, the reality is that the predominant number of the group’s members no longer lives there. For instance, of the 1,700 members of the Amalia/Costilla group, only 37 people currently live in the village of Costilla and while they do not register in Facebook statistics, based on shared comments and my personal knowledge of who is in the group, there are possibly about 15 individuals that currently live in the mountain village of Amalia. Nevertheless, most of the members of the group reside in large cities, including Denver or Albuquerque, and in countries as far away as New Zealand and Costa Rica. While I have accentuated the benefits of the platform that Facebook is providing in imagining a community-centered archive and museum, there are also challenges and potential pitfalls, such as issues around privacy and the use of algorithms to determine who sees what posts, and why. Perhaps the most concerning aspect is that of data sharing within a closed, proprietary system with no means of external backup or data downloads, likely very complicated due to the necessity of obtaining permission from participants. Yet these are some of the challenges we must address in building collaborative projects — for to stand the test of time, they must have mechanisms to outlive at worst the very existence of private companies or at best their regulations that surely will change what and how they store, use, display and archive from a community memory. The content and comments in these closed Facebook groups around historical events, community gatherings, family celebrations and hardships, also cannot be easily captured and preserved by archivists, group administrators, or the general public. On one hand, this type of group allows for a conversation to thrive within the context of a close-knit community, purposefully limited to those within the group. On the other hand, the shared history and memory of the group, and the creation and use of shared research and intellectual property, is currently left to the small print of Facebook user agreements. 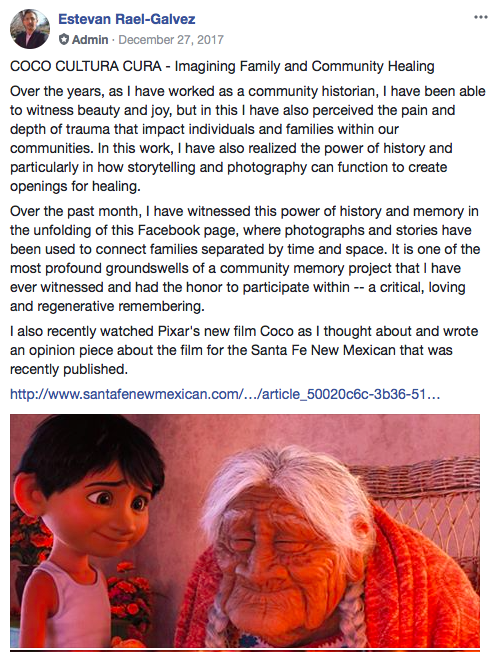 Post by Estevan Rael-Galvez on family healing and the movie Coco, Questa Facebook Group, 2017 highlighting an op-ed piece in the Santa Fe New Mexican. There are also potential unforeseen pitfalls on social media that I have witnessed emerging within these group sites, such as myths and factual errors being spread quickly. There is also a politics to what is shared, by whom, where and how. Other questions of profiting without permission from the photos, stories and documents by those other than the original posters require consideration. Photos and stories that have existed only in the intimacy of family homes, but that now are suddenly being shared broadly could potentially lead to family disagreements. Perhaps even more challenging is the fact that in any community there are hurts and traumas that exist, either as inherited or experienced. Social media provides a platform to share joy or grief, but ultimately it may not be the best setting in which to air a hurt. In the end comments could negatively escalate, with no relief. 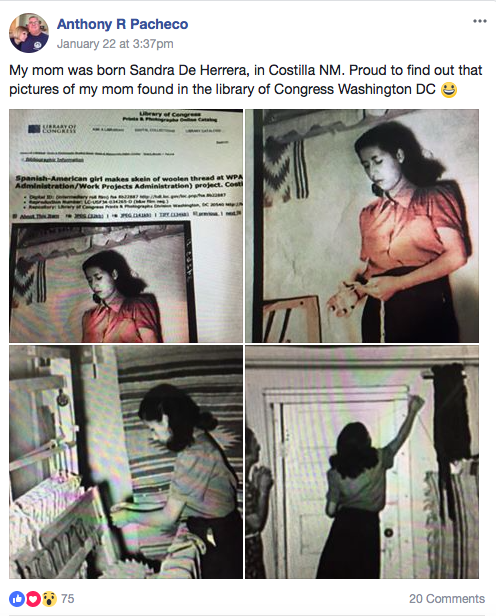 Post by Anthony R. Pacheco on the Costilla, New Mexico Facebook Group in which he identifies his mother as photographed in the FSA Photos, 2017. In spite of the challenges, technical and cultural, in three short months, what has developed is nothing short of a community-based archiving project that includes the constant posting of personal photographs, documents, genealogies and stories. Other archival content is included as well, such as FSA-OWI photographs, though now thanks to the participation of the group, these images are augmented with context and content not previously shared in academic monographs, websites or exhibits. Among videos, ancestral files, newspaper clippings, letters and stories, the predominant posts are photographs as old as one capturing a mid-19th century wedding to more recent family portraits, school classrooms, and action shots of individuals working in mines, cafés, kitchens, roads and sheep camps. Indeed, the project has drawn images of everyday life reflecting the sorrowful as well as the joyful moments. Building upon both the original objective set forth in the Mellon Foundation grant and the momentum of the Facebook groups, even while recognizing the challenges, there are several opportunities for refinement and expansion, with an overall goal to develop and sustain a replicable model for collaborative, community-centered memory projects focused on rural communities. Outside of repositories in the distant cities of Albuquerque, Denver and Santa Fe, there are no archives easily accessible to these rural villages of northern Taos County, much less that focus on their history. For those who would like to locate documentary evidence of their ancestors, there are certainly traces to be found with dedicated searching, but as has become obvious from the Facebook groups, the predominance of family photos, letters and other memories are found in homes, bundled in shoeboxes, carefully arranged in scrapbooks, and framed on walls, not only in these villages, but across the diasporic landscape. Though it may be that the stewardship of these items in homes is fine, particularly since new platforms now encourage the sharing of this information, it also could be that efforts to support these ‘homes as archival repositories,’ would be appreciated, such as hosting workshops, virtual or otherwise, that could support preservation, digitization and sharing. 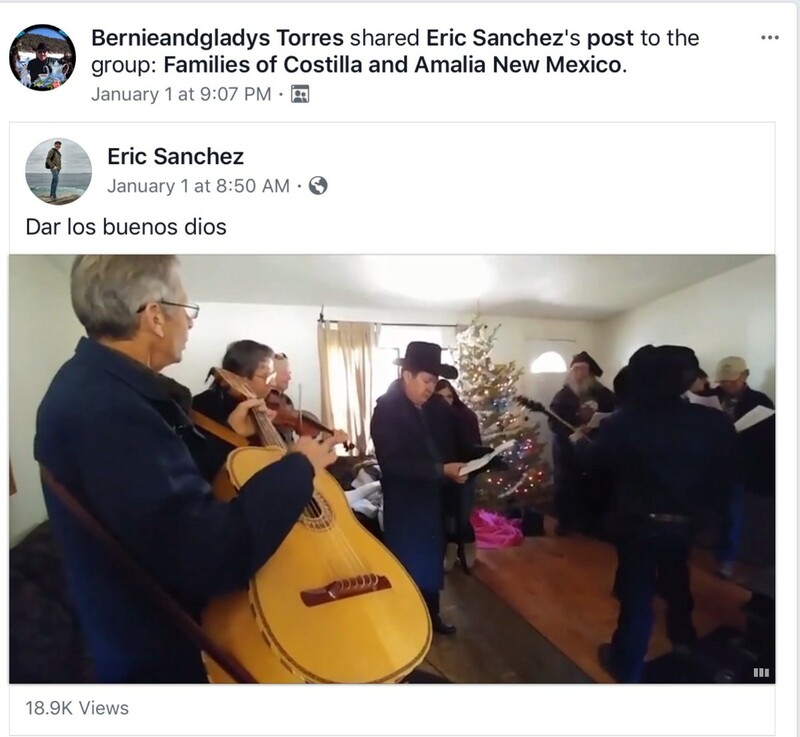 Post by Bernie Torres of a video posted by Eric Sanchez of a New Year’s Day tradition, ‘Dando Los Dias’ a video that was viewed across multiple sites, nearly 20K times. Posted in the Costilla Facebook Group, 2017. The word “archive” has a variety of taproots, but its link to the Greek verb arkhein carried a sense of ‘beginning’ and in this way, rethinking what a ‘community-based archive’ is could point to this new beginning. Building on the tremendous energy in these Facebook groups, there is the possibility to leverage that momentum, broadening and deepening it and understanding its limits. While it is clear that people are mostly utilizing the technology available through their smartphones to simply photograph and share documents or photos, there is room to improve on these methods. For example, some members have posted videos of live holiday traditions, but so far only one person has utilized the audio recording capabilities on their iPhone to capture an elder’s stories. I suggest some potential strategies to further magnify and amplify the digital archive collection amassing on-line: 1) post step-by-step instructions for creating files, scanning high resolution images, and cropping photos; 2) encourage sharing both video and audio files with the online group; and 3) host workshops focused on both technical and content-based researching in cities where the predominant number of members are located, including in the villages themselves. These workshops could also include working with elders to write their own memoirs. Considering audio files, another idea is to initiate a full-scale oral history project as informal or formal as the group wished. Drawing upon the original idea of a collaborative, here is where partnering with universities and appropriate non-profit organizations for instruction would be ideal. In this way, individual members of the Facebook group could learn to record and edit sound. These key partners could also be instrumental in providing other background and support regarding the archival collection process and generating content for dissemination. Regardless, the group should define how the community-based archive develops. It may be that it is not only digital; for instance, perhaps interest in establishing a physical archive in a local library or other easily accessible institution will emerge. I believe that the possibility of what a museum can be is actually carried in the word that tells us what it is. Etymologically, the word museum comes from the ancient Greek, mουσεῖον, mou-sei-on, place devoted to the muses. As I think of the traditional museum, those charged to program it, the curators, comes to mind. In reimagining a community-centered museum, the practice of community curation is becoming increasingly feasible. It is perhaps no mistake that that both the words ‘curious’ and ‘curator’ share the Latin root word cūra — care, cure and healing — an active role tied to the well-being of others and core to what is possible for this project. Sparking interest is an imperative that we should all encourage for what we hold in our buildings and in our collections. In thinking of the possibilities, similar to the archive, one could be an online experience. While the content currently being generated on the Facebook groups could be recalibrated for the purposes of more formal archiving, the content also could be more carefully curated, grounded in the purpose of a museum to disseminate knowledge. Currently, the groups sporadically share information or content, which is part of the beauty of the project, but there may be other platforms in which this could be better accomplished, such as through a robust web presence. 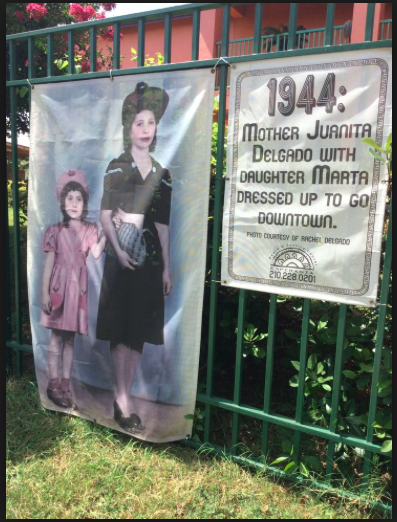 Image of Fotohistoria displayed on the Westside of San Antonio, Texas, Project of the Esperanza Peace and Justice Center, circa 2015. Another museum project could be to develop an “object stories” initiative. An especially astute observer of museums, the novelist and Nobel Prize recipient Orhan Pamuk, in his “A Modest Manifesto for Museums” noted that “the future of museums is inside our homes.”⁷ As practitioners, we also should be curious about what is outside of our own museum walls. There are so many ways that cultural institutions can engage their neighborhoods, and sometimes all it takes is asking them who they are and what they value. Inspired by the work of the Portland Art Museum and in my own work with organizations and cities, an object stories project, invites the community to bring an object that means something to them — not for collection purposes — but to share and record its story, thus providing a platform for storytelling and remembering. In rural communities, there are almost never archives and museums within close proximity, but there sometimes are libraries which have served their purposes to share collections of books, and increasingly have become spaces for exhibits, meetings and even repositories. 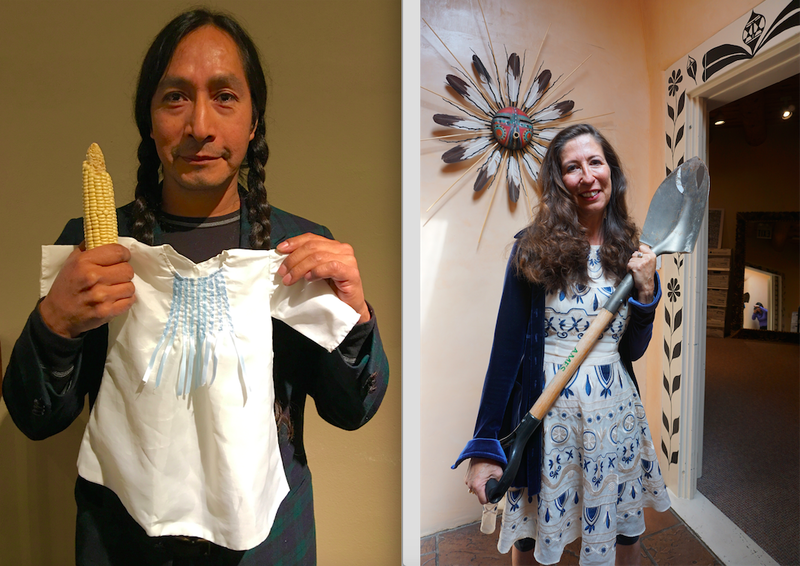 Gomeo Bobelu and Teresa Leger de Fernandez participate in the Object Stories project initiated as part of Culture Connects Santa Fe, 2016. Reinvigorating a community is a primary objective. 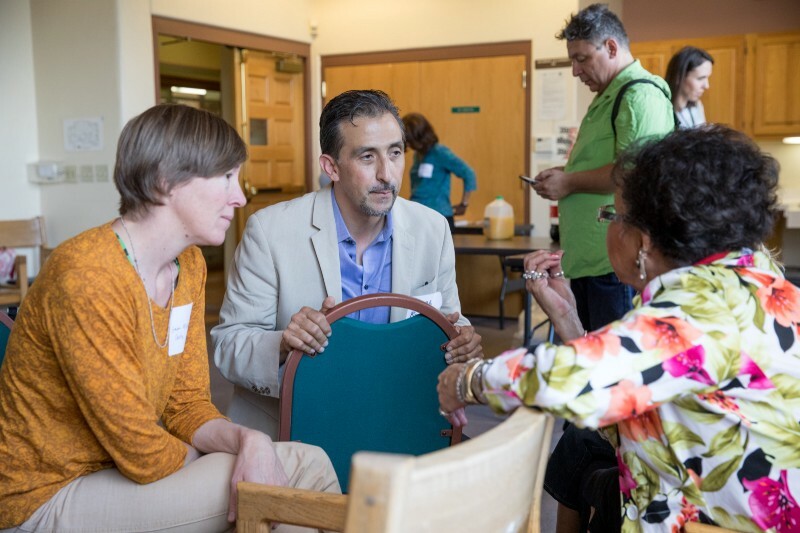 This vision will require understanding the importance of the “power of place,” connectivity and the imperative of developing and executing a plan that contributes to the vibrancy and health of all of its residents. 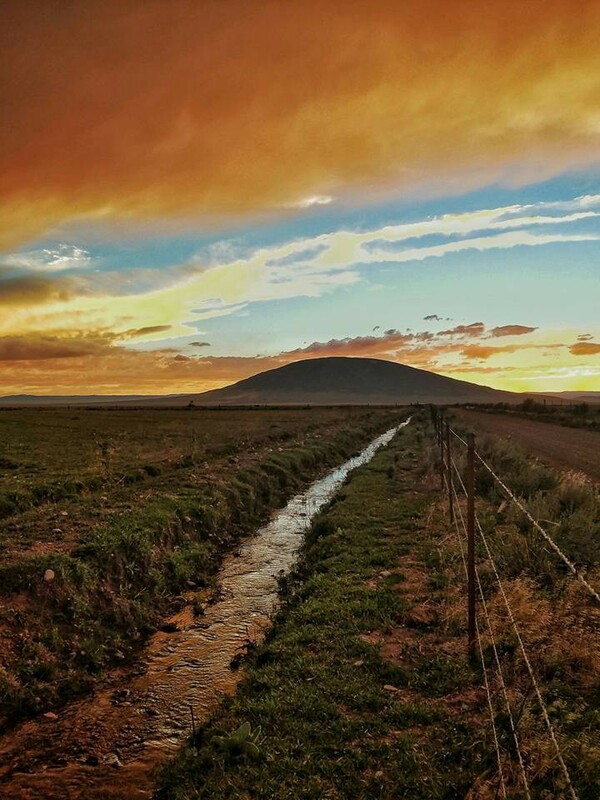 While the northern New Mexico rural villages are a region of astounding beauty and rich in legacy, they are also places beset with a multitude of challenges, both economic and social. Recognizing these villages fully must necessarily be a part of any effort to move forward. Including those community members who form the diaspora of people whose origin can be tied to this region and giving recognition to how these communities are redefining themselves, holds such incredible potential. Tremendous potential also exists to re-imagine the promise of those that came before them, to continue to strengthen the community — culturally, economically and spiritually. Understanding the historical context of how knowledge was collected in a colonial context, as well as the imperative of addressing historic trauma, it is clear that storytelling and photography can function to create openings for reimagining community history and healing. As Maori scholar, Linda T. Smith, has cogently observed, “In order to decolonize our histories, we must revisit site by site.” Similarly, in her work to recover Latina histories, Emma Perez, novelist and Associate Professor and Chair of Ethnic Studies at the University of Colorado, Boulder, uses the term “decolonial imaginary” as a way to overcome a colonial past, by literally re-inscribing new possibilities. A decolonial imaginary demands that we create a new cartography, a new way of recording presence and a new way of remembering ourselves whole. The counterpoint lies in our ability to decolonize the past as we creatively imagine the future, to ground it in the networks that are essential to our communities, our organizations and our classrooms — spaces that are changing all around us, and by this, raise consciousness core to the philosophy of why history matters. 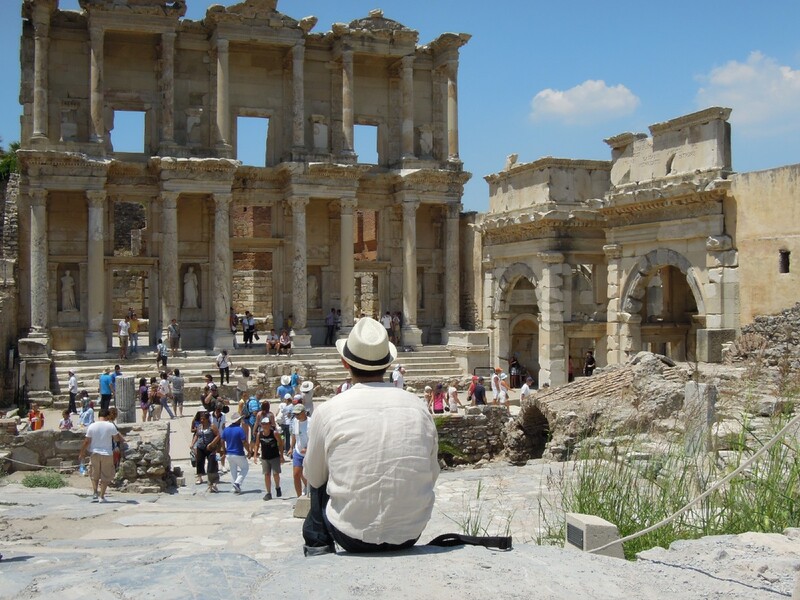 Healing and transcendence lie in the capacity, as it always has, of awakening a practice of memory that does not simply contemplate history, as Eduardo Galeano writes, but invites us to make it. A native son of the American Southwest, Dr. Rael-Gálvez is currently a writer, creative strategist and the founding principal of Creative Strategies 360°, which supports transformative work within communities, governments, universities and cultural-based organizations. 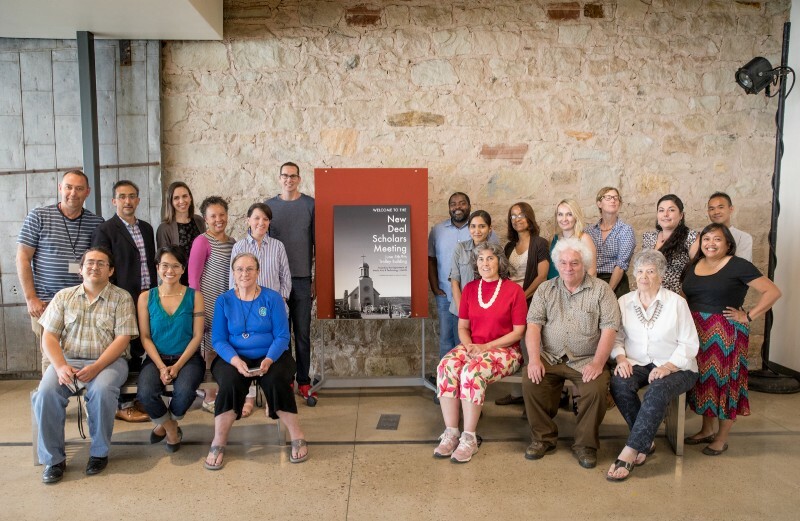 Prior to this work, he led a full career as a successful senior executive including: Senior Vice President of Historic Sites at the National Trust for Historic Preservation; Executive Director of the National Hispanic Cultural Center; and the State Historian of New Mexico. See the introduction to Carolyn Hamilton, Verne Harris, Jane Taylor, Michele Pickover, Graeme Reid and Raizia Saleh, eds., Refiguring the Archive (Cape Town: David Philip, 2002), 8. Bell Hooks, “Narratives of Struggle,” in Critical Fictions: The Politics of Imaginative Writing (Seattle, Bay Press, 1991), 54. 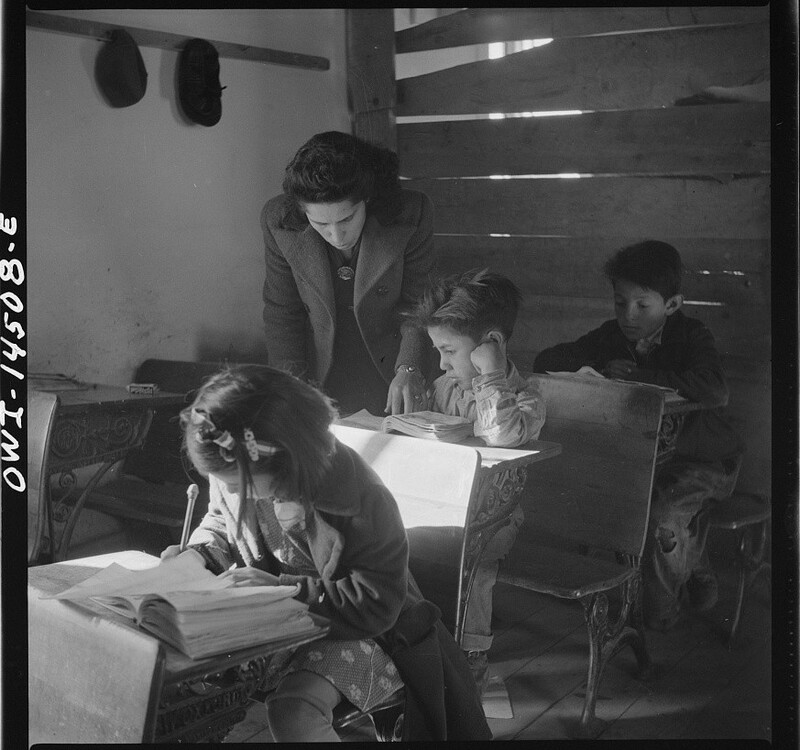 This idea is inspired by the incredibly successful effort led by the Esperanza Peace and Justice Center in the westside neighborhoods of San Antonio, Texas called “En Aquellos Tiempos: Fotohistorias del Westside.” The author envisions something similar for the northern New Mexico communities focused on gathering photos. Orhan Pamuk, The Innocence of Objects (New York: Abrams, 2012).